Yusra Mardini at the Wasserfreunde Spandau 04 training pool in Berlin, Germany. Mardini is one of 10 refugee athletes who will compete as a team during the Rio Olympics. Credit: photo courtesy of International Olympic Committee. In August of 2015, Yusra Mardini and her sister, Sarah, fled Syria after their home was destroyed in the country’s civil war. The sisters traveled on land through Lebanon and Turkey, eventually boarding a boat with 18 other refugees. When that boat’s motor failed in the Aegean Sea,Mardini, her sister, and another woman jumped out and pushed the boat for three hours to the island of Lesbos. Mardini would later tell a press conference in Berlin that “it would be a real shame if I drowned in the sea.” Many refugees do drown attempting to reach safety in Europe—2,500 died this year alone—but that is not what Mardini meant. South Sudanese refugee Anjelina Nadai Lohalith will compete in the 1500-meter run on the refugee Olympic team in Rio. Credit: photo courtesy of International Olympic Committee. Team Refugee Olympic Athletes (ROA) was created by the Executive Board of the International Olympic Committee in response to the global refugee crisis resulting from nearly 20 million refugees, as of 2014.Meaning the Earth now has about 1 million more refugees than there are Romanians or Syrians. In 2012, Romania sent 103 athletes to the summer Games. While everyone may have a right to practice sport, not every athlete has a nation to call home. “This will be a symbol of hope for all the refugees in our world, and will make the world better aware of the magnitude of this crisis,” said IOC President Thomas Bach, when he announced the final team selection. “It is also a signal to the international community that refugees are our fellow human beings and are an enrichment to society.” The refugee team is funded by the Olympic Solidarity Programme, created to assist those National Committees in need of organizational resources and training support. The Solidarity Programme already supports more than 1,700 athletes from developing countries, in addition to the refugee team. Given the Olympic-sized audiences Rio will bring, the stories of the refugee athletes will provide a new, powerful opportunity for those working to ameliorate the refugee crisis. The London Summer Olympics in 2012 was the most watched TV program in U.S. history. Second on that list is the Beijing Summer Olympics in 2008. Worldwide, the Olympics measures its viewers inbillions. This is important at a time when global public perceptions of refugees are low, the United Nations reports. In the United States, refugees have been met with disdainful public opinion, according to PEW Research. Attitudes toward immigrants are often divided along party lines, with 59 percent of citizens saying immigrants strengthen the country and 33 percent calling them a burden. Yet the stories of refugee athletes are filled with adversity and deserve to be heard. Misenga and Mabika, the judoka from Congo, defected from their homeland when they applied for asylum during a 2013 Judo Championship tournament in Rio. Misenga fled after his mother was killed and his brother disappeared. “I’ve seen too much war, too much death,” he says. Mabika’s story is similar; her family was lost in Congolese conflict. Both turned to Judo as a way out. “Judo is my life. It helped me escape war, to take another path,” says Mabika. 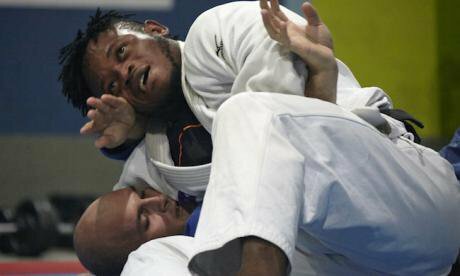 Judo athlete Popole Misenga, a refugee from the Democratic Republic of the Congo, now resides in Brazil as he trains for this summer's Olympics. Credit: photo courtesy of International Olympic Committee.